Fresh garden tomatoes make the best salsa. This is a recipe for making your own fresh stewed tomatoes. When your summer garden produces tomatoes in abundance, prepare stewed tomatoes for recipes requiring tomatoes, like salsa. If you grew up on a farm or in a family who gardened, you are probably familiar somewhat with blanching vegetables. When I was young, I wondered what my mother meant at blanching the squash, tomatoes, and other vegetables. In my observance, she was cooking them. That was somewhat true. She cooked them long enough to soften. For instance, my favorite vegetable was yellow summer squash. First, Mother sliced the fresh squash and onions then blanch them. Next, they cooled. Finally, the squash and onions were put into freezer bags and placed into the freezer. Whenever squash and onions, tomatoes, or other vegetables were needed for a meal, they were thawed and ready to cook with seasonings. 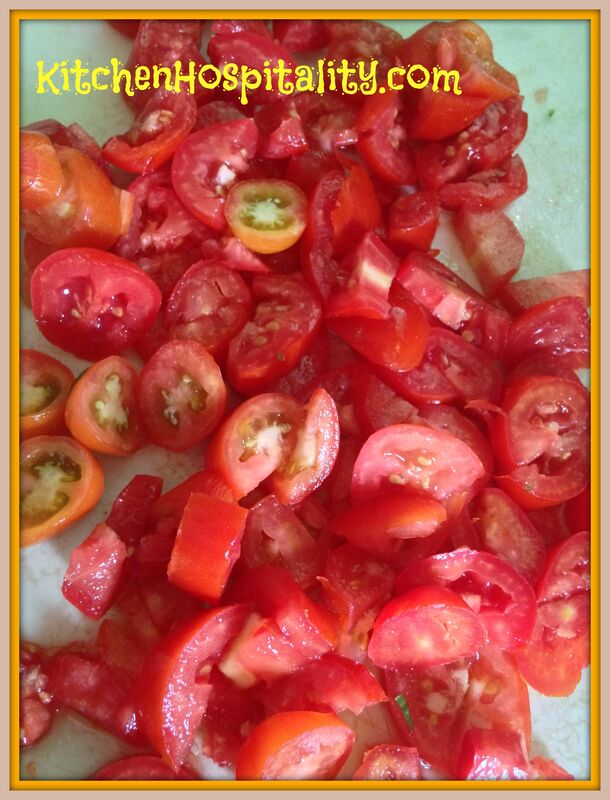 Stewed tomatoes are peeled and blanched to use for later use. Combine other vegetables from your garden in the slow cooker with the tomatoes. For instance, I used yellow summer squash in one of my salsa recipes. The aroma of those fresh garden veggies brought back memories of tomatoes and okra cooking in my mother’s and grandmothers’ kitchens. Relish for topping on peas or beans – Good homemade Chow-Chow is the best, but a stewed tomato relish is good. Eat the tomatoes as a side – Back in the day, stewed tomatoes and bread made up the whole dinner. Chili – Chili without the tomatoes? No way! The way my family ate chili when I was growing up was with plenty of ketchup on top and served with crackers. Vegetable soup – You may like your vegetable soup without tomatoes, but mine end up with tomatoes every time. Garlic Powder or 3-4 garlic cloves. Place tomatoes in a pot of boiling water for about a minute. Transfer them to a bowl of ice water to soften the skins. Mash the tomatoes, or cut them in quarters. Put all ingredients in slow cooker with the seasonings. Cook in slow cooker on high for 3-5 hours or low for 6-8 hours. Use for salsa or other recipes. Optional: This recipe works well with tomatoes that are not blanched, also. Substitute squash with any of your garden vegetables to cook with the tomatoes. I love the flavor of stewed tomatoes. But they taste great in salsas without stewing them. Try both, and see which you like best. 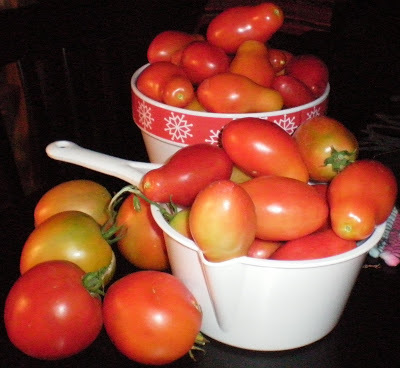 Here are my organic Romas I cooked for my last salsa. This would be a great base for a minestrone soup. Yummy! Forgot to mention that your family has probably never eaten white chicken chili. It’s very good even without tomatoes. I don’t think we have…can’t remember. Do you have a minestrone soup recipe?